It was a happy reunion with the dogs at Orphans of the Storm®, since I had missed them for three weeks! I was able to spend some time with my old buddies and make new furry friends, too. 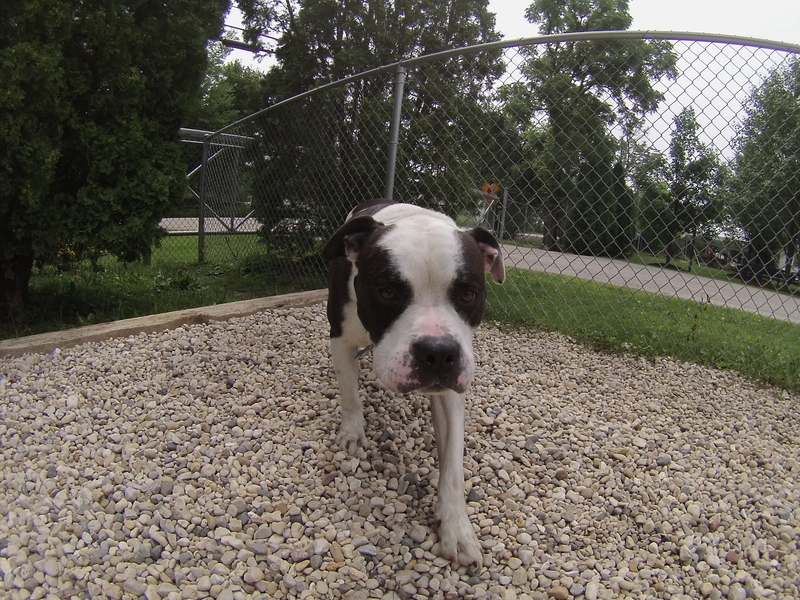 Rocky the six-year-old American Bulldog mix unfortunately found himself at the shelter when his previous owner moved and couldn’t bring Rocky with them. Rocky is a big boy, but such a sweetheart. He already has years of experience as a pet, so he’s more than ready to begin his second chance at a happy, furever home. Rocky loves to be around people and never strayed too far from me when he was off-leash in the run. 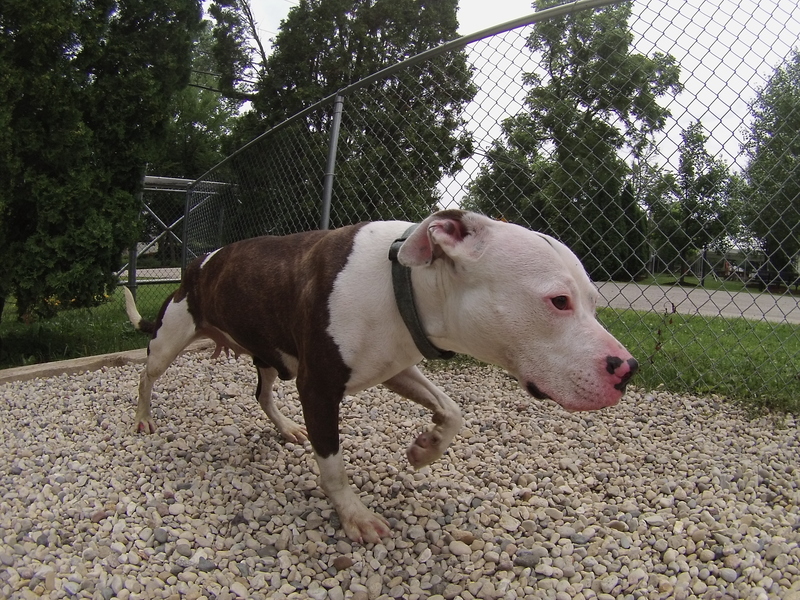 Rocky is an easy-going boy, too. His fur wasn’t as white as it could be, so after we took our walk we headed over to the hose for a quick bath. Rocky was pretty much perfect, standing still both while getting scrubbed with doggy shampoo and while getting rinsed. He looked so handsome afterwards! 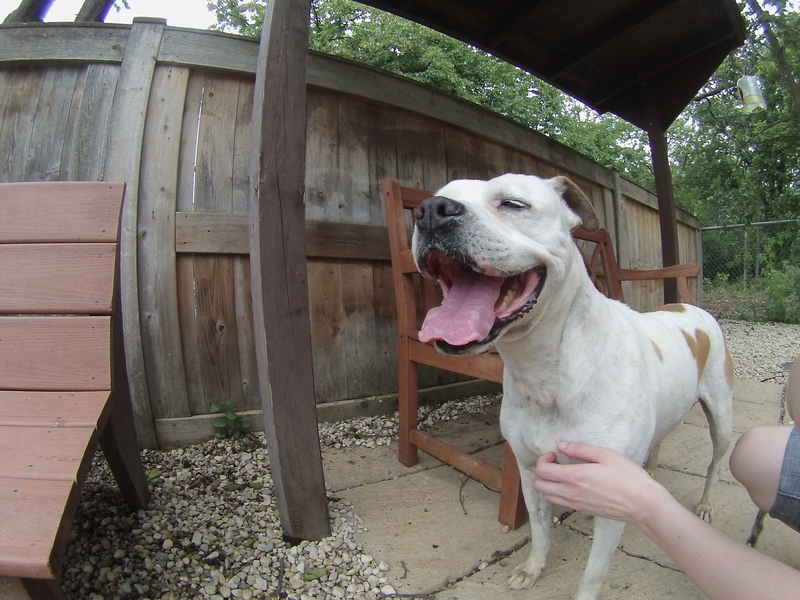 If you’re looking for a big pooch with a big heart, come in soon to meet Rocky! Jessica the two-year-old Staffordshire Bull Terrier mix was found as a stray along with her puppy, and both were brought to Orphans of the Storm®. Her puppy was adopted quickly, but as is too often the case, Jessica the mommy is waiting longer to find her new home. Jessica was understandably a little nervous at first, but she came out of her shell as we spent more time together. Jessica, despite being a stray, is very well-behaved. She walked on the leash pretty much ideally, staying by my side most of the time and rarely pulling. She seems pretty friendly with other dogs, based on the way she politely sniffed the dog on the other side of the fence in the off-leash run and showed an interest in some of the Chihuahuas that were out for a walk (though the Chihuahuas were not reciprocating niceties). 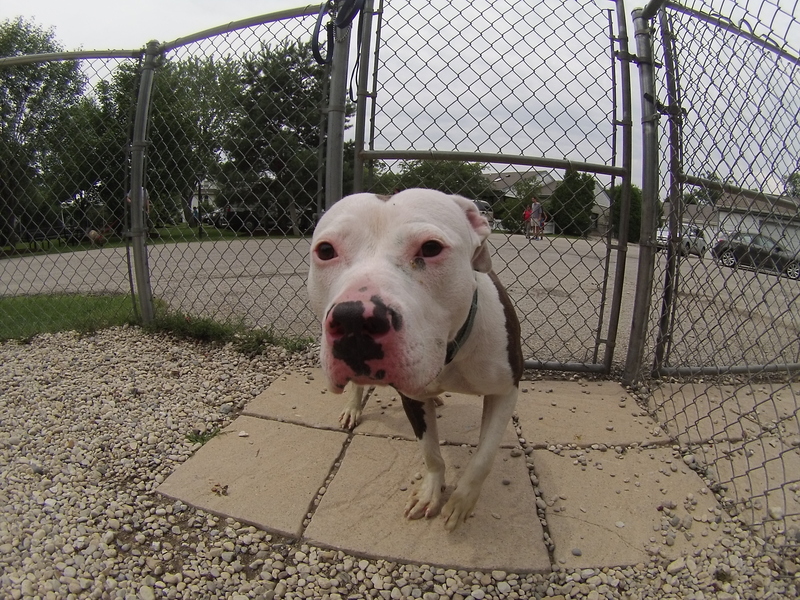 On your next visit to the shelter, say hello to Jessica to find out if she’s the pooch for you! 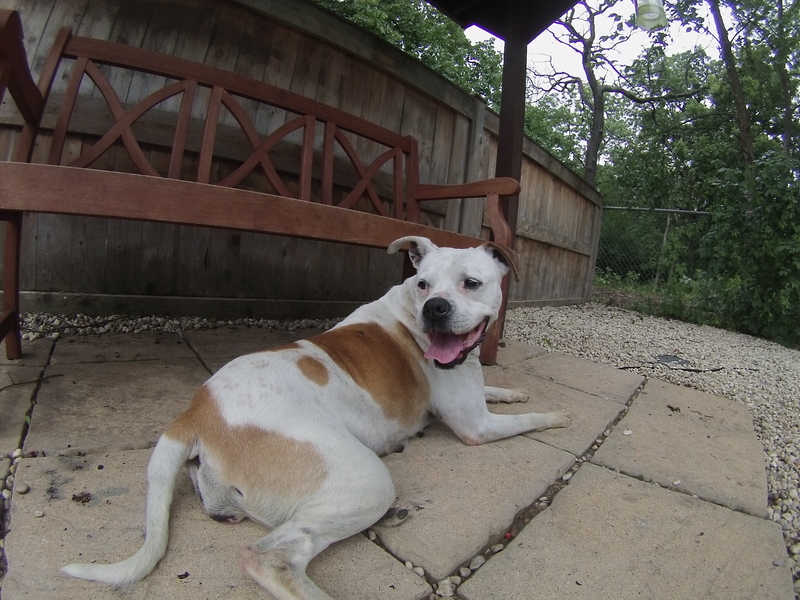 Lexi the five-year-old Boxer mix is a friendly girl with a constantly wagging tail. She was absolutely thrilled when she realized it was her turn to go out and gave me a big doggy hug to show her appreciation. Lexi had plenty of energy when she first got to the off-leash run and had a great time racing the dog on the other side of the fence. After she had the opportunity to romp, Lexi plopped onto the ground next to me so I could pet her. Lexi was wearing a cone the first time I saw her a few weeks ago and wasn’t able to go home yet, but now she’s ready! She does have remaining medical needs, which the staff at the shelter can discuss with you if you think you want to bring Lexi home. Lexi isn’t worried about any of that, though–she’s just excited to have the chance to find her furever family. Stop by the shelter soon to meet Lexi! I also saw Blush, Cooper, Ginger, Jasmine, Red, Rock (who, you should remember, went to doggy boot camp and is fully trained), Scotty, Tucker, Zoey, and the other Zoey. 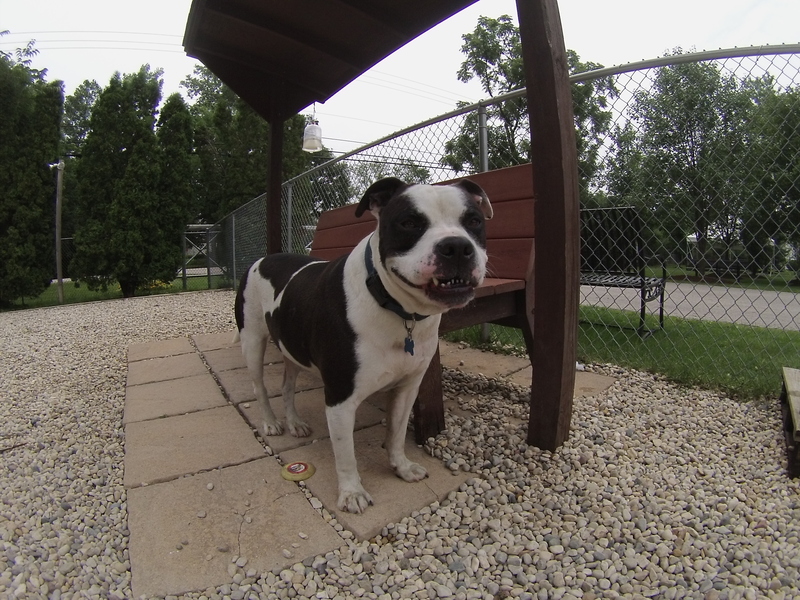 Posted by Meet the Pooches on July 17, 2015 in Dog Profiles and tagged adopt, adoption, American Bulldog, animal shelter, animals, Boxer, Chicago, Deerfield, dogs, Orphans of the Storm, pets, Riverwoods, Staffordshire Bull Terrier.